Rick Macomber watched the sky show over the Zakiim at sunrise. 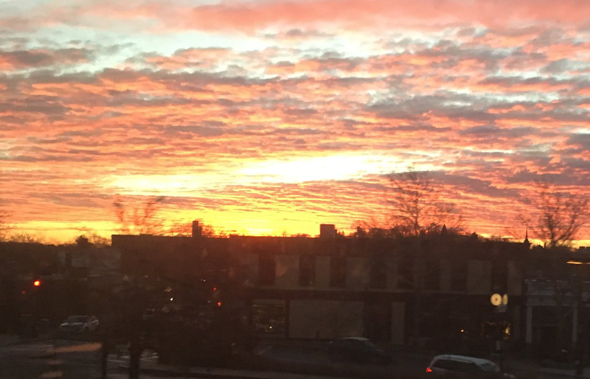 Rick Macomber had a great perch for this morning's sunrise. He's looking south over the Leverett ramps, the Zakim, Boston Garden and the North Station train tracks. 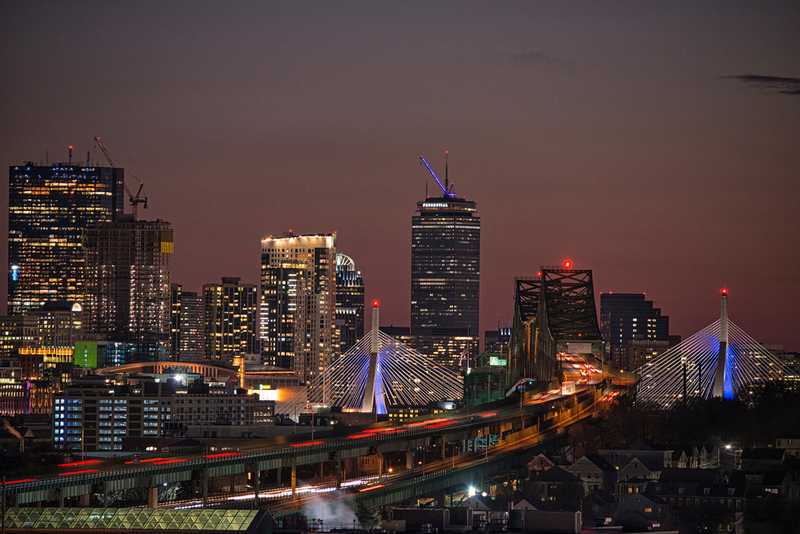 617 Images shows us the Zakim tonight, lit in blue to honor Yarmouth police officer Sean Gannon, 32, shot to death while serving a warrant last Thursday. Nick Gillham took a walk on the North Point pedestrian bridge last night. Copyright Nick Gillham. Posted in the Universal Hub pool on Flickr.. 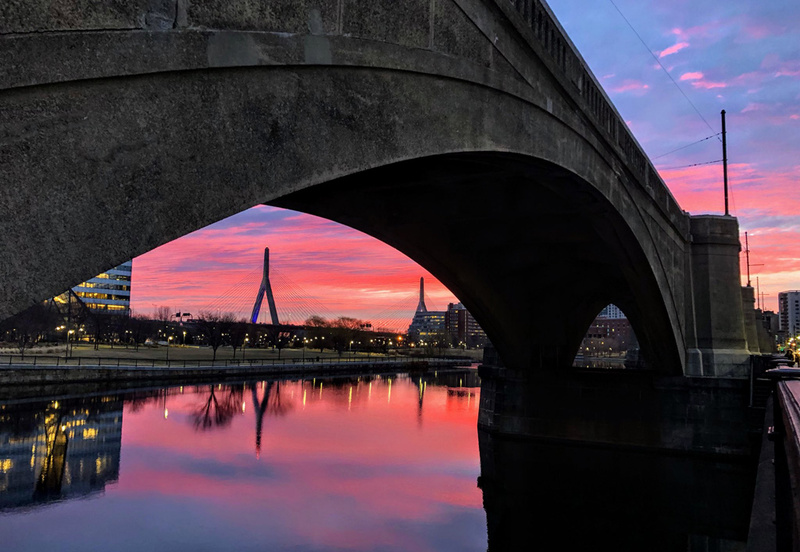 Rob Littlefield watched the sunrise through the Green Line viaduct over the Charles near the Museum of Science this morning. Cybah found an equally engaging view on the other side of the ol' Shawmut Peninsula: Read more. State Police provided this video from the Zakim tonight. No word what the bun was doing there or if either trooper was named Elmer. 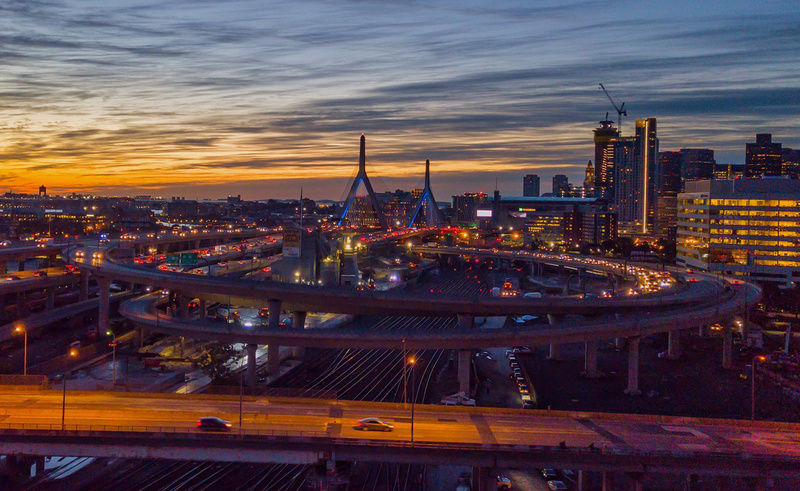 Jon Skarin watched the sun go down over the Zakim and downtown Boston tonight. Read more. 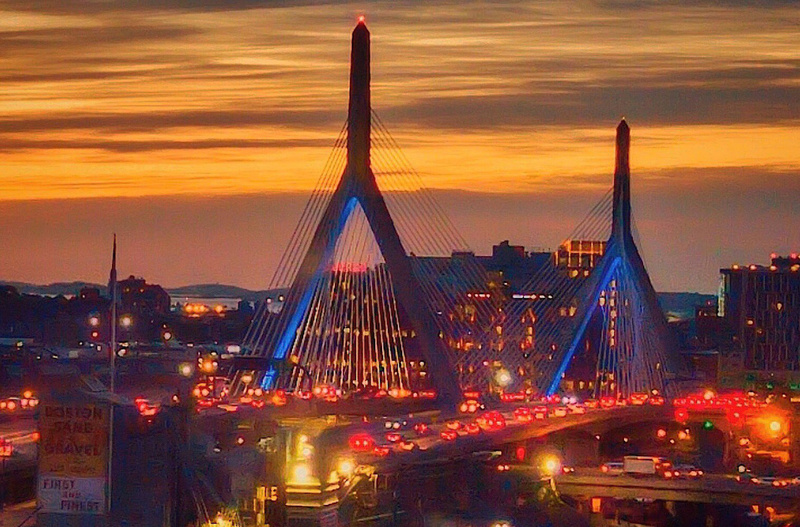 Matt Frank watched the sun go down over Boston Harbor and the Zakim Bridge this evening. WBZ reports the driver had to be hospitalized after the one-car crash on the northbound side of the Zakim. Earlier, a tractor-trailer briefly slid out of control on the Zakim: Read more. Around 3 p.m. on the northbound side. State Police report the bridge is now open again. 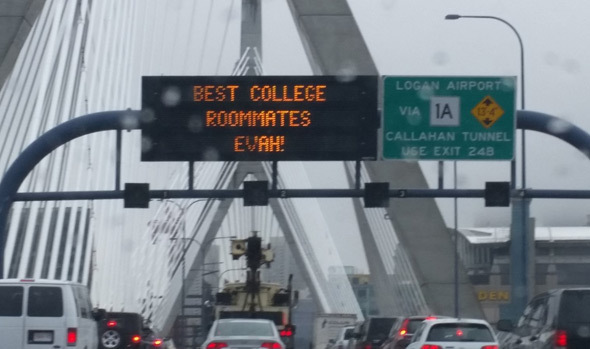 MassDOT is up to its Boston English-lovin' ways again, this time to urge college roommates to learn fire escape routes from their dorm rooms, as Sharon McAuliffe shows us this morning. 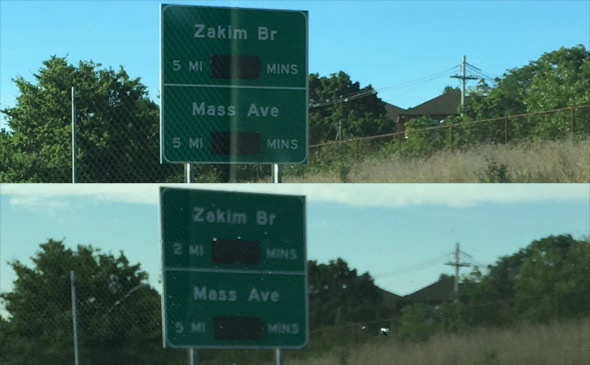 Last Thursday, David Innis tweeted to MassDOT that something was amiss on this sign on I-93 south at the Somerville/Medford line - and not just that no times were showing up - because the Zakim and Mass. Ave. are nowhere near each other. By this morning, as you can see from the lower photo, the state had fixed the distance. Now if they can only get the time thing working (MassDOT says they're working on that). 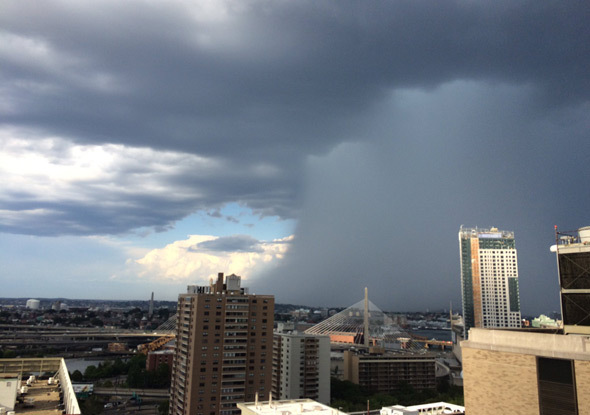 It looked like a killer death storm was about to swallow up Boston late this afternoon. That John Gage was able to post this photo strongly suggests it didn't. It did, however, get pretty intense in places such as Chelsea and Melrose: Read more. Quo vadis, Mr. Bicycle Man? "This can't be legal, right?" 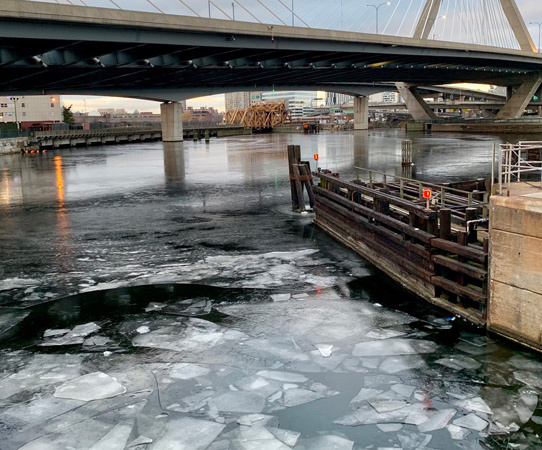 Katie Arsenault asks about the unusual sight she saw on the Zakim this afternoon. 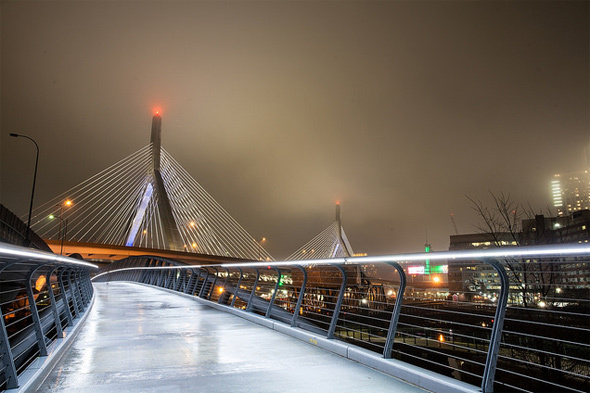 617 Images shows us the Zakim lit up like it's 1999.